Description: The good news: Microsoft Dynamics GP v10 is now compatible with Windows 7, the bad news: Microsoft Dynamics GP v9 is not! The Dynamics GP Product Management & Marketing team has announced it on their blog, however, the official stand on the System Requirements page on CustomerSource and PartnerSource won't be until the Windows 7 RTM version is publicly available on October 22. 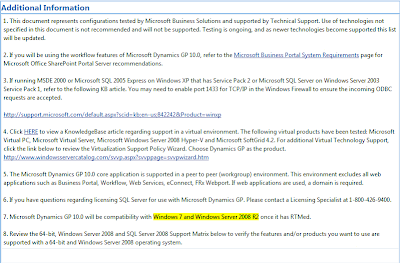 For those of you awaiting compatibility with Microsoft Windows Server 2008 R2, the Additional Information page also makes it clear that compatibility can be expected with the RTM version. However, this may be interpreted as testing has also been completed on the server operating system as well, but the team will hold off until the official RTM version is released. I am not surprised if some of the delays on v10 Service Pack 4 obey to assuring compatibility with Windows 7 and Windows Server 2008 R2. After all, why release a Service Pack to then have to release a hotfix.